Bai et al. show that an RNA splicing factor promotes normal cell differentiation and stops excessive cell proliferation in the corn kernel. Background: Most eukaryotic genes have extra sequences, termed introns, which need to be removed from the RNA before it can produce a protein. The process of RNA splicing literally cuts out the introns and splices the remaining RNA together, like editing a movie on film. There are two types of introns that are spliced out by different RNA-protein complexes. More than 99% of introns are spliced by the major spliceosome complex, while the minor spliceosome recognizes only a few hundred introns. Splicing of minor introns is significantly slower than the major type of introns and the minor introns in minor intron-containing genes (MIGs) can limit overall expression of these genes. MIGs appear to have roles in controlling cell division and development across divergent eukaryotes. Question: We found a mutation in corn that causes defective seed development and disrupts a gene encoding an RNA splicing factor named RNA Binding Motif48 (RBM48). We wanted to know how this RNA splicing factor is important to plant cells, specifically we asked: Which organisms have RBM48 genes? What type of introns does RBM48 help to splice? 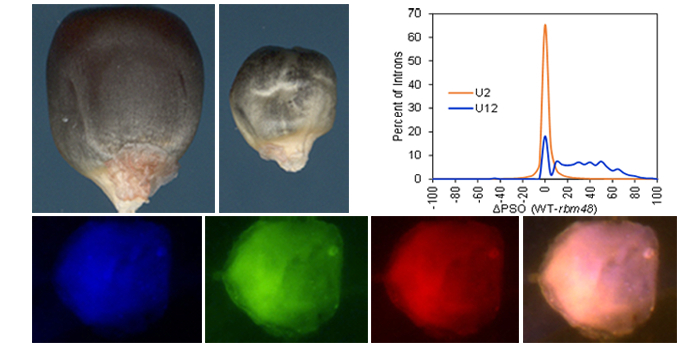 How does splicing of these affected introns promote normal seed development? What other RNA splicing factors does RBM48 work with in the cell? Findings: An RBM48 gene is found in all eukaryotes that also are known to have the minor spliceosome, including humans. Minor splicing was specifically defective in rbm48 mutants. The disruption of MIG splicing causes endosperm cells to divide like a cancer instead of differentiating to support seed development. RBM48 protein interacts with both major and minor splicing factors that are involved in recognizing the 3-prime end of introns. These data show that the minor spliceosome has a critical role in multicellular development. Next steps: RBM48 is the second minor splicing factor that we have found to disrupt normal differentiation of cell types in corn. Are there specific MIGs that cause the cell and development phenotypes? Can we identify additional minor spliceosome proteins with genetic screens? Finally, does the RBM48 protein in other eukaryotes have a similar function in minor splicing and cellular development?